South Africa has urged the African Union (AU) and United Nations (UN) Hybrid Mission (UNAMID) to continue to provide technical and logistical assistance to support peace efforts in the Sudan. 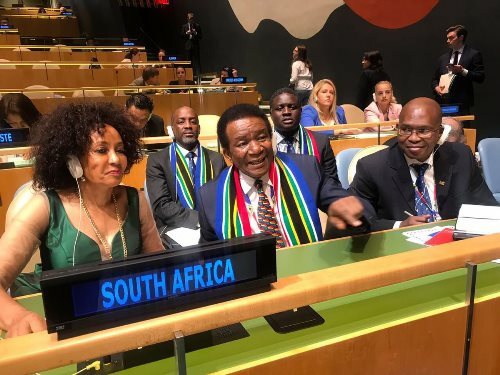 South Africa’s representative at the United Nations, Ambassador Jerry Matjila, made the call after a debate at the UN Security Council briefing on Sudan sanctions. “We remain concerned at the continued violations of the arms embargo against the Sudan, including the transfer of weapons to Darfur, which destabilises the situation on the ground. “In this regard, we urge UNAMID, in accordance with Resolution 2429, to continue to provide technical and logistical assistance to the Sudan disarmament, demobilisation, and reintegration (DDR) Commission,” Matjila said. While South Africa welcomed the improvements in the security situation in Darfur, it urged the UNAMID to continue to ensure the protection of vulnerable civilians, especially in internally displaced people’s (IDP) camps and in the prevention of gender-based violence in Sudan’s western region. Women and children are the most affected by sexual violence, which has also increasingly become a weapon of war and conflict affecting the long-term prospects for peaceful and prosperous communities. “In this regard, we would like to commend the government of Sudan for its efforts in trying to combat sexual violence in conflict,” the envoy said.